Mix & Match Any Combination of 10 and Save 10%! 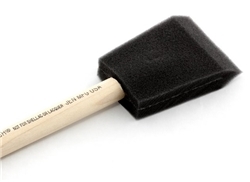 The original Poly-Brush by Jen Manufacturing in the USA. This is the premium foam brush with good stiffness and durability that far exceeds the performance of cheap, poorly made knock-offs. Available in 4 sizes, constructed from dense foam that resists shredding and cracking. Intended to be disposable, but easily rinsed for storage and future use. Don't be tempted to buy that "Bag-O-Brushes" from the dollar store...they will be no match to the original Poly-Brush by Jen Mfg! Use with waterbased stains, paints and clear finishes as well as most oil based stains or varnishes. (Not suitable for lacquer or alcohol shellac solutions).